COLD is a rare gem in the City of London, opened in 2012, it finally brought back the distilling of gin to the City after 200 years – and boy do they take it seriously. Climbing down the stairs on unassuming Bride Lane, you’ll walk past their enormous copper stills, Clarissa and Jennifer, on display, which play part of the many Gin Experiences they provide: from tours, flights and tastings, to ginstitutes and making your own gin. The atmosphere at COLD certainly is one of a late night bar. Dark green walls with an impressively stocked bar and vintage paraphernalia bask in the glow of the stills’ lighting. Further back the sense of being underground heightens, as the Hoodooist hunted down the winged leather Chesterfield armchair in the corner (as one does). 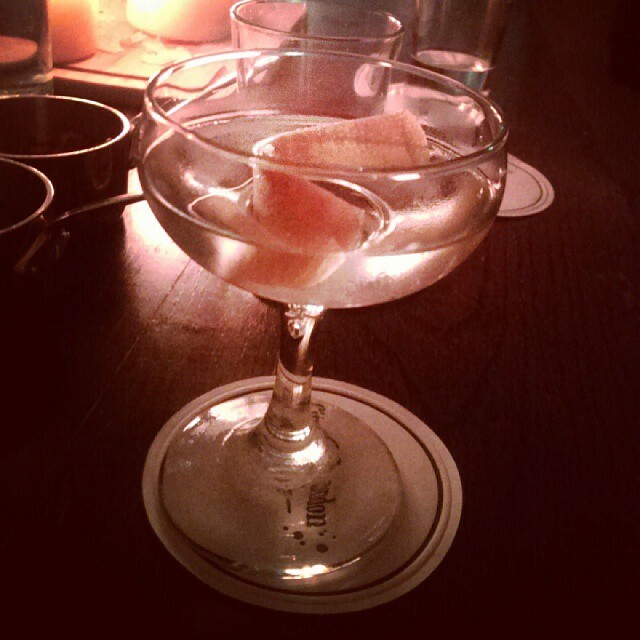 COLD Distiller’s Martini: City of London Dry gin, Mancino Bianco with a pink grapefruit twist. As aforementioned, the gin is already fairly grapefruit-heavy, so pairing it with the garnish, and a more bitter vermouth that is distinctly flavoured with grapefruit and orange was a bold choice. The gin gives a slight pepperiness to the Martini, but one must acknowledge the overwhelming grapefruit of the drink – moreso than any of the other cocktails here serving up CoL Dry gin. It provides a decidedly smooth Martini that only isn’t to my taste because of the overdone grapefruit, although I did take to it more after getting the garnish out. A winning drink coming up was a White Martinez, Cocchi Americano, City of London Dry Gin, Luxardo Maraschino, dash of Regans Orange Bitters, maraschino cherry garnish dropped in. This is excellent, but also very sweet, even in comparison to most Martinez’. The orange bitters really does come through with the grapefruit of the CoL gin; combatting with the thick sweetness of the Cocchi Americano and Luxardo Maraschino. Further down the drink, the cherry gets a chance to release its sugars into the drink for further sweetness. Somehow still a wonderful drink regardless of its intense sugariness – but one that takes time to drink. Chatting with our absolutely wonderful server, a bespoke Gin Old Fashioned was concocted, and was exactly that – an Old Fashioned with Beefeater Borrough’s Reserve Oak Rested Gin – sugar, bitters, grapefruit rind. A sophisticated cocktail often avoided by most bars, using a gin avoided by many gin purists, handled well and confidently, here at COLD. Probably more suitable to a drink like this, Beefeater Borrough’s is rested in French Oak barrels that used to contain Lillet Vermouth, that adds to the gin’s juniper and citrus notes of oaky vanilla, and winter spices like cinnamon or nutmeg. This gin certainly isn’t a Martini gin, but a wonderful idea to use it as a Gin Old Fashioned. Inspired. After those 3 successful drinks, though, there was one hiccup – the OMG & Tea was a warning with the name, really. CoL Old Tom Gin, Bitter Truth Golden Falernum, Merlet Crème de Peche, Breakfast tea, lemon juice, soda water, garnished with mint and lemon. It ended up being a confused muddle of citrus soda at the end of it. Honestly though, this is a drink that is a warning from the outset, so it was silly to try it. What COLD does best, is present sophisticated, alcohol heavy drinks – the menu’s occasional attempts into more ‘fun’ cocktail regions come with risk upon reading the ingredients. The highlight of the night though, was the incredibly knowledgeable and convivial service. Conversing with our servers was a delight, and a highly educational experience. Polite, attentive, the staff are stars. In summary, COLD is a unique gem in the heart of London’s business sector, and has won awards with good reason. 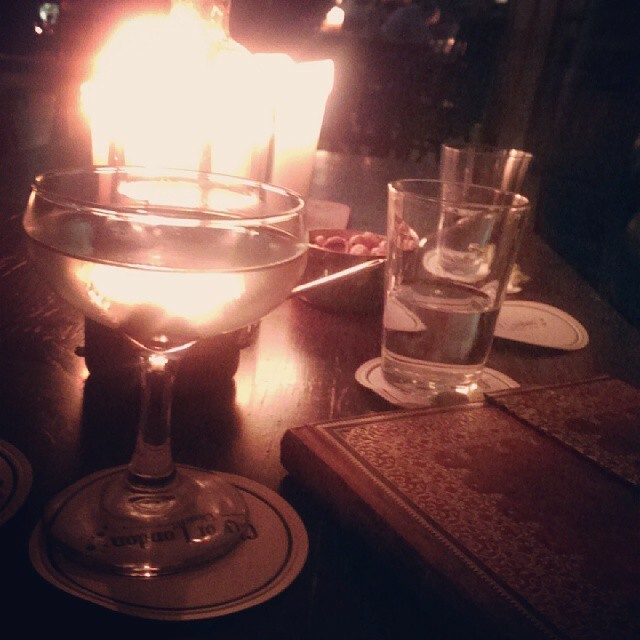 Providing an incredible list of experiences and events, besides their unique gins, makes it a destination in itself. It’s strength lies in its simpler, more sophisticated drinks that demand skill and finesse to construct, and in its wonderful service. A hit in our books. This entry was posted in Bars & Cocktails and tagged After Work, Basement, Date, Education, Gin, Ginstitute, Large Groups, Small Groups.